...and it's only after you step outside your comfort zone that the real stuff happens. The mind blowing, life altering, amazing moments. Because, if you can imagine it, you can have it. Despite how comfortable you might be, nestled in the routine of life, there is so much more that can be yours, will be yours. Step outside and let it unfold, the life you imagined, the one in your wildest dreams. 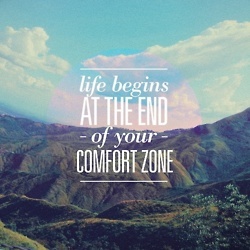 Life truly does begin at the end of your comfort zone.